The Jasper Leather Bar Stool Oak & Black will inspire you to make the most of your bar area, every single day. The epitome of tradition and class, the Jasper is a timeless model with a steadfast and sturdy design that will stand the test of time in your kitchen. The black bonded real leather seat and backrest pads contrast with the look of the wood, simultaneously cushioning your body. While a central space between the seat and backrest creates a chic window into your surrounding environment. The solid oak frame is rich in tradition, meanwhile, a crisp chrome footrest invites you to relax your feet. Finally, protective plugs help to ensure the Jasper's suitability to virtually any surface, making it an excellent addition to any room you like. "Easy to build, great quality and comfortable"
Good quality, price and delivery. Excellent assembly instructions and support. 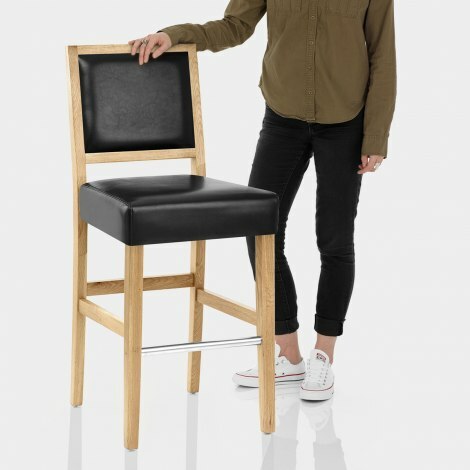 Excellent quality, easy to assemble , look really good, leather soft and comfy to sit on, best breakfast bar stools yet !! Many thanks. Had slight issue with delivery, was supposed to be here on a monday, but didn't arrive until the Wednesday, but when i contacted atlantic shopping about this, they were very helpful, don't think it was there fault, guaranteed delivery for the wednesday and i was very pleased with the product, easy to put together, very sturdy and very comfortable chair. would use atlantic again.